The Walcheren Expedition of 1809, which Lord Chatham infamously commanded, was unquestionably a disaster. Although the British managed to take the islands of Walcheren and South Beveland, they failed to get to Antwerp, the ultimate objective, to destroy the fortifications there and the French and Dutch fleet. Most seriously of all, the army was rendered completely useless by a violent illness known as “Walcheren Fever”, thought to be a combination of malaria, typhoid, typhus and dysentery. Of the 39,219 men sent to the Scheldt River basin, 11,296 were on the sick lists by the time the inquiry was underway. 3,960 were dead. The British Army suffered from the recurring effects of “Walcheren fever” until the end of the war. Not long after the last soldier had been landed back in Britain in January 1810, the House of Commons formed itself into committee to inquire into whose bright idea it had been to send nearly 40,000 of Britain’s best (i.e., only) troops to a pestilential swamp at the height of the unhealthy season. Careers were at stake, and nobody wanted to own up. 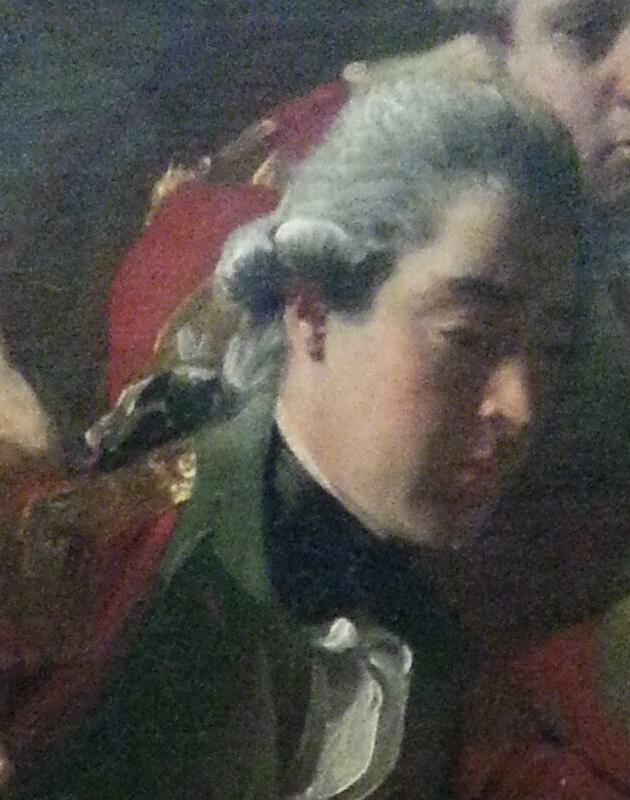 Chatham, the military commander, was nevertheless pretty sure he knew who was most to blame for what had happened. Unsurprisingly, it wasn’t him. Contrary to what nearly every historian of the campaign has tried to argue, however, it wasn’t his naval counterpart, Sir Richard Strachan, either. Chatham wasn’t very successful at fighting accusations of his sloth and incompetence, and he eventually ended up with most of the blame for the campaign’s failure, even if the Walcheren inquiry technically cleared him of wrongdoing. In my opinion, however, one aspect of Chatham’s evidence has been overlooked: his indictment of the Board of Admiralty, under the First Lord, Earl Mulgrave. After the inquiry was over, Chatham wrote a series of memoranda defending his conduct on Walcheren and during the parliamentary proceedings that followed. These memoranda reveal Chatham’s conviction that Mulgrave had been trying to cover up the Admiralty’s role in planning the expedition for months. By April 1810, when he probably wrote these memoranda, Chatham was as paranoid as it is possible for a man to be. Nor was he the least bit impartial in the matter. And yet there is some evidence that the Admiralty – a highly organised political body, and one with which Chatham (a former First Lord himself) was extremely familiar – did indeed try to conceal evidence from the inquiry. The Board of Admiralty having made inquiry respecting the practicability of effecting a Landing between the point of Sandfleet and Fort Lillo … are prepared … to undertake that the troops shall be conveyed, when the Island of Beveland, including Bathz is in our possession, to the Dyke between Fort Lillo and Sandfleet, and landed, as far as the question of Landing depends on the nature of the place, with relation to the approach to the shore of boats and other vessels capable of receiving troops. Why was this so mysterious? Because Chatham remembered this memorandum rather differently from the form in which it was published for the inquiry. According to Chatham, the Cabinet had only approved the expedition in the first place after the Admiralty Board had issued this Opinion as a guarantee that a large fleet could carry twenty thousand men up the West Scheldt and land them at Sandvliet. This was in response to doubts voiced by Chatham himself – doubts formed after discussions with military officers who had been to Sandvliet and told him an army could not be landed there. Since the whole plan hinged on landing at Sandvliet, Chatham rather reasonably told the Cabinet he would not undertake to sanction his own expedition unless the Admiralty could prove the military men wrong: “This last Point I considered as a sine qua non [which] … must be placed beyond all doubt, to warrant the undertaking the enterprize [sic].” Mulgrave’s response was the 19 June memorandum, which circulated through the Cabinet the day after it was drawn up. Chatham remembered it as being signed by the three professional Lords of the Admiralty. In 1809, these would have been Sir Richard Bickerton, William Domett, and Robert Moorsom. Chatham’s assertions are to an extent backed up by official correspondence. Following the mid-June cabinet meeting, Castlereagh informed the King of the need to postpone preparing for the expedition until “the practicability of a Landing at Sandfleet [sic] can be assured”. Two days after the circulation of the 19 June Opinion, Castlereagh wrote: “Under the sanction of this opinion … Your Majesty’s confidential servants … feel it their duty humbly to recommend to Your Majesty that the operation should be undertaken”. Castlereagh edited out the line “should the Immediate object be abandon’d”, which suggests that the viability of a Sandvliet landing was indeed the make-or-break feature – to borrow Chatham’s words, the sine qua non – of the expedition going ahead. All this corroborates Chatham’s account completely, except for one detail. Three copies of the Opinion exist, one in the Castlereagh MSS at PRONI (D3030/3241-3) and two in the National Archives (ADM 3/168). None is signed. The copies of the Opinion that remain are therefore no more than that – an opinion. They were unofficial, and could not be claimed to form the basis of any Cabinet decision to undertake the expedition. Did Chatham simply misremember the opinion? This is the opinion of Carl Christie, who deals with the 19 June Opinion thoroughly in his excellent thesis on the Walcheren expedition. “The suspicion is that his memory was playing tricks on him”, Christie writes, and concludes that he “misinterpreted the Admiralty opinion”. But Chatham clearly wasn’t the only one who did so, as Castlereagh’s letters to the King show above. The question, therefore, is whether a signed Opinion ever existed. We only have Chatham’s word for this; but it does seem unlikely that the Cabinet would have made the important decision to proceed with the expedition on the basis of the opinion of two subordinate naval officers. (Popham in particular had a track record of leading British troops into madcap schemes that often went wrong, as the Buenos Aires expedition of 1806 demonstrates). Castlereagh later played down the importance of the opinion: at the inquiry, when questioned about it, he seemed confused as to which memorandum Chatham had intended to single out, and fudged the issue by saying there was a paper “which I may have seen in circulation, with the names of three [Admiralty] lords attached to it, but I rather imagine that it is the same paper as that which is dated the 9th of June”. But the Admiralty opinion of 9 June 1809 was on a completely different topic, and had also been drawn up prior to the Cabinet meeting to which Chatham referred. An attempt was made in the course of the Enquiry, to question the existence of this Document, and they [the Admiralty] never would produce it, but they did not venture to call the Sea Lords [to give evidence], and with them the question whether they had not signed such a Paper and delivered to Lord Mulgrave, to be shewn to ye Cabinet. So where is the signed version of the Opinion the Admiralty failed to produce? Did it ever exist? Castlereagh’s evidence, vague as it was, certainly suggests that it did. Chatham was certainly convinced the Admiralty was covering its back at his expense. Was he right? In the new year I suggested to my husband that I would like to visit Walcheren before finishing my book. He looked interested, but not that interested, so I decided to up the ante. Me: We could cycle it. Husband (perking up): What, you mean the whole way? And so we planned an Easter trip (because, you know, Russian roulette with the weather is all part of the fun). Arrangements were made for the kids to go to their grandparents; I made a suggested itinerary, compiled a long list of likely campsites, booked train tickets and ferries, and we packed. As lightly as possible, as we would be cycling 450 km (280 miles) on a tandem. For those of you who are not au fait with the Walcheren Expedition of 1809, this, in a rather rotten nutshell, is what happened. The Walcheren expedition was Britain’s contribution to the Fifth Coalition with Austria. Austria would conduct the main continental campaign against Napoleon while Britain engaged in a diversionary attack in an area of her own choosing. Britain chose a “coup de main” against Antwerp, which was a huge French dockyard and commercial centre. Destroying Antwerp would be a cheap way for Britain to neutralise the danger of French invasion, pierce Napoleon’s Continental System which was damaging British trade, and draw Napoleon’s attention away from Austrian action inland. Unfortunately the Battle of Wagram put Austria out of the war before the Walcheren expedition even started, but the campaign continued anyway in the hope that victory would keep Austria in the war. Lord Chatham was appointed to command the military part of the biggest expeditionary force fielded by Britain so far during the war: about 40,000 soldiers and over 600 vessels, more than 200 of which were warships. Sir Richard Strachan commanded the naval part of the expedition. The expedition consisted of four parts. The smallest, under Lord Huntly, would land on the Cadzand shore and neutralise the French battery at Breskens, allowing the main part of the fleet to enter the West Scheldt. Meanwhile, 12,000 men under Chatham’s second-in-command, Sir Eyre Coote, would lay siege to Vlissingen (Flushing). The reserve under Sir John Hope would take control of the neighbouring island of Suid-Beveland, allowing the remaining 20,000 men under Chatham himself to sail all the way to Sandvliet, reduce the largest forts protecting the narrow part of the Scheldt (Lillo and Liefkenshoek), and march on to destroy the dockyards of Antwerp. Things went wrong almost immediately. The expedition sailed (late) at the end of July, and ran into a storm. Home Popham, the unofficial Captain of the Fleet, saved the expedition by sailing it into the sheltered Roompot and through the Veere Gat at the furthest point of Walcheren, but this meant most of the expedition (except for Huntly) were now in the East rather than the West Scheldt. Meanwhile, Lord Huntly failed to land at Cadzand, which meant the Breskens battery remained active and continued to reinforce Flushing by boat. This meant the British ships could only enter the West Scheldt through the sandbank-filled Sloe Passage separating Walcheren and Suid-Beveland. Understandably, it took time and effort to get hundreds of troop and supply transports through to the West Scheldt. Chatham and Coote landed on Walcheren on 30 July 1809 at Breezand and initially made swift progress. By 3 August, all Walcheren except Flushing and all Suid Beveland were in British hands. At this stage the campaign stalled. The British fleet could not get into position to complete the siege of Flushing because of unfavourable winds, and the French continued reinforcing the town until 7 or 8 August. Because of this Chatham was forced to reinforce Coote from the men destined for Antwerp, putting that part of the plan on hold until Flushing fell. With no time for a slow siege, bombardment was the only option, but the British batteries were slow to build due to poor weather and did not open until 13 August. After two days of intensive bombardment Flushing fell, and after a short delay Chatham moved onto Suid-Beveland to continue to Antwerp. By this time, however, the French had managed to bring 35,000 men to the area, removed their fleet further upriver, and repaired their fortifications. At about this time, sickness also broke out among the British troops. By the end of August a quarter of the army was out of action with a crippling combination of malaria, dysentery, typhus, and typhoid. Chatham called off the expedition on 27 August, and returned to England in mid-September with the bulk of the army. The politicians had hoped to retain the valuable commercial base of Walcheren, and 16,000 men remained there with that in mind, but by December it was clear possessing the island was not worth the cost of defending it and it was evacuated. Thankfully, our expedition was rather more successful, although we didn’t get to Antwerp either……….. The first two days were, essentially, spent just getting there. We left Oxford at 3:00 am on 28 March, caught the train to West Folkestone, and cycled the remaining distance across the cliffs to Dover (grrrmbllr engineering works grrmmbbllr). The beginning of our journey was considerably enlivened by Storm Katie, which decided to break the night before we left. We had one cancelled train because of a tree on the line, and some delays, but apart from that Katie did little but give us a very rough ferry journey and then a tailwind on the other side (wheeeeeeeeeee). We spent the first night in De Panne (Belgium), and on the second day reached Cadzand. If you consult the map at the top of this page, you can see we were approaching Vlissingen (Flushing) along the Wielingen Channel, which forms the opening to the West Scheldt. This was where Lord Huntly failed to land and disable the Breskens battery, which continued reinforcing Flushing for most of the siege. Flushing, incidentally, is the town on the right with the tall buildings. We proceeded to Breskens, where we caught the ferry across to Flushing. I thought about the French reinforcements for Flushing making the same journey in 1809 under the nose of the British ships, rendered completely inactive by the contrary winds. I wonder if they indulged in a few rounds of “Your mother was a hamster, &c” as they went. I imagine they probably did. Once in Flushing, I was expecting to find the place looking very new and shiny with very few pre-1809 buildings surviving. The devastation of Chatham’s August 1809 bombardment was, by all accounts, pretty extensive. I was agreeably surprised to find the town full of 16th and 17th century buildings. I daresay most of them lost their roof in 1809, and probably again in 1944, when the British returned to flatten Flushing a second time (this time by RAF bombing). There is quite a lot about the role of Walcheren in WWII on the island: several plaques, statues, monuments, museums, etc etc etc. There is virtually no sign of the 1809 expedition, however, which goes to show that victories are much more likely to be remembered than failures, particularly when said victories occurred within living memory. Some of the fortifications were 16th century, although most dated from 1812, when the damage the British made to the harbour on leaving in 1809 was repaired. There was a windmill from 1699 on the seafront though, which appears in many prints of the bombardment of Flushing. After leaving Flushing, we made our way to Middelburg. Middelburg was where Chatham established his main headquarters, from 1 August 1809 until he moved to Suid-Beveland on 21 August. He returned there at the beginning of September. Middelburg, the Capital of Dutch Zealand, is a very handsome opulent town, well paved & lighted. The streets are pretty regular, and the houses very well built. … The appearance of the Town denotes a great degree of ease & opulence. … The Town is surrounded with a wide wet ditch of regular Bastions, but there are no Guns mounted on the Ramparts & the environs are so covered wth habitations & Plantations, that It could make no defence, so long as they were suffered to exist. The Groote Kercke, or principal church has a handsome steeple & very melodious chimes, which are for ever in play. I can testify to the church chimes being “very melodious” and “for ever in play”. I could imagine Chatham being kept awake by them at *cough* ten o’clock in the morning *cough*. Yes, I probably spent more time looking at the fixtures than at the museum exhibits (those were interesting too). The Abbey itself (it closed in 1574) is a magnificent building, and I can totally understand why Chatham spent so much time there. We wandered about Middelburg for a couple of happy hours. I should mention that at this stage of the trip I had not yet fully realised where we were yet and so the full import of our location had not yet penetrated. I suppose on some level I was kind of aware I was in the place I had been reading about for so long, but I think it was only when we reached Veere, the next day, that I truly realised WE WERE ON WALCHEREN. Research often relies on serendipity, and I experienced that powerfully yesterday. I was in the National Library of Scotland, plugging a few research gaps, and called up a letter from 1817 written by John, 2nd Earl of Chatham, in the Walter Scott Papers. 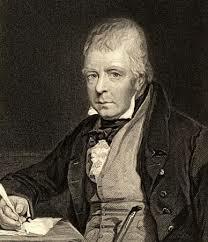 As far as I know, Chatham had no direct contact with Sir Walter Scott, although his wife’s sister (the Duchess of Buccleuch) was Scott’s patroness. I was curious to see what the letter was about. In fact it was one of several letters on the subject of the death of Sir Henry Hollis Bradford, who (if you will cast your minds back to a recent post of mine) had been one of Chatham’s aides-de-camp for many years. Bradford had served Chatham since about 1807 in the Eastern District, and followed him to Walcheren. Thereafter he pursued a distinguished career under Wellington in the Peninsula, and was seriously wounded during the Battle of Waterloo. Bradford died on 17 December 1816 in France at the age of 35. I did a little digging on Bradford when I wrote my earlier blog post, but yesterday I learned a whole lot more about him and the circumstances of his Waterloo wound and death. 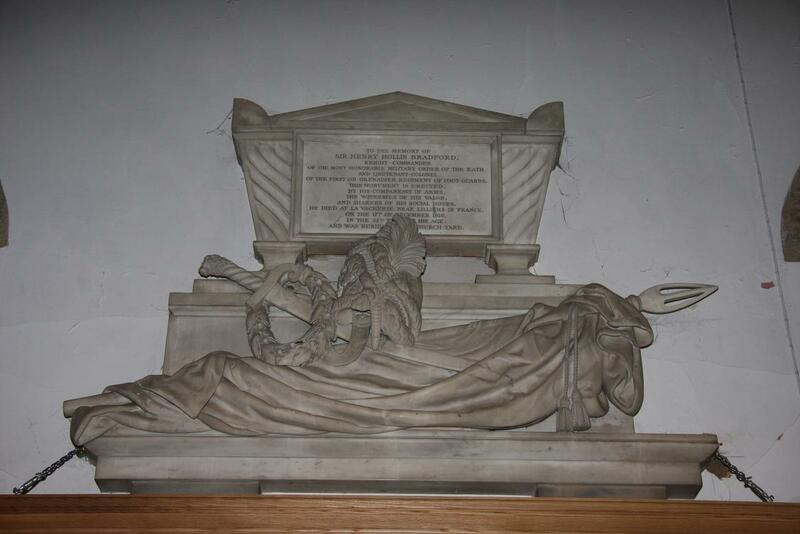 It seems he was a friend of Sir Walter Scott, which is how all this correspondence survived in the first place, because his brother, General Sir Thomas Bradford, suggested Scott might want to compose the epitaph on Bradford’s tomb. It is a consoling circumstance that … he [Bradford] lost his Life in the service of his Country & on an occasion when his Services were most distinguished. After having gone thro’ all the dangers of the 16th June, it became his duty as Q[uarter] M[aster] General to the Division of Guards, to direct & superintend the defences of Hugoumont [sic] which were so essential to the sucess of the eventful 18th … He was wounded towards the close of the Day on the 18th, at the moment of the general charge which repulsed the Imperial Guard. [The ball] must have struck upon the side of the Vertebrae and recoiled upon the Spine of the Os Ilium where it was extracted on the 18th of June 1815 … An abcess took place on the Liver which came to the Skin[,] was opened[,] and healed. These are all the intermediate circumstances. A fever came on yielding to no mode of treatment[.] Great despondency[,] irritability, wasting ensue[d], and the Patient die[d]. … My opinion is that all the most distressing Symptoms, the despondency, depression[,] emaciation[,] and the death which was the consequence of these Symptoms took place in consequence of the wound, by means of which the Spinal Marrow had been much irritated (although … no paralytic symptoms followed) that the brain and nervous System were disturbed beyond their bearing … Every thing possible was done, and … nothing could have saved him. It is of course possible that the wound had gone septic and killed him slowly over the course of several months; reading between the lines of the correspondence, however, Bradford seems not to have suffered overmuch physically from long-term effects, but was certainly strongly scarred mentally. Not, of course, an unnatural thing to happen, particularly as he seems to have had some damage to his spine. Your Letter reached me this morning and I have in the first place to offer you my thanks for the kind and considerate manner in which you have executed the painful task imposed on you by Sir Thomas Bradford who has indeed done justice to my feelings towards his poor Brother, in thinking how severe an affliction the fatal event you had to communicate must prove to me. In poor Bradford I have lost a most valuable and intimate Friend, for whom I had the sincerest affection, and whose progress through life I had followed with the most anxious interest, and it was ever a source to me of the truest gratification to find, how much both as a man and an Officer he was admired, esteemed and loved by all who knew him. Most sincerely indeed do I condole with all his family on this sad occasion, and on whom I fear this most heavy blow must have come rather unexpectedly. I will not break in upon Sir Thomas Bradford in his present scene of distress with any Letter but as I shall be really anxious to know how he and all his Family are, I should be very much obliged to you to give me one line to say how you left them. I regret extremely that being absent from Town, I shall be deprived of the pleasure of seeing you, when you were so good to call in Hill Street, and I should have derived a melancholy satisfaction, in hearing from you every particular you could give me respecting the fate of my poor departed friend. To the memory of Sir Henry Hollis Bradford, Knight Commander of the most honorable Military Order of the Bath, and Lieutenant Colonel of the First of Grenadier Regiment of Foot Guards, This Monument is erected by his companions in arms, the witnesses of his valor, and sharers of his social hours. He died at La Vacherie, near Lilliers in France, on the 17th of December 1816, in the 36th year of his age; and was buried in this Church-Yard. It isn’t much, but it is eloquent in its simplicity. I’d like to think Scott wrote it, and that Chatham’s regret helped shape the sentiments of it. 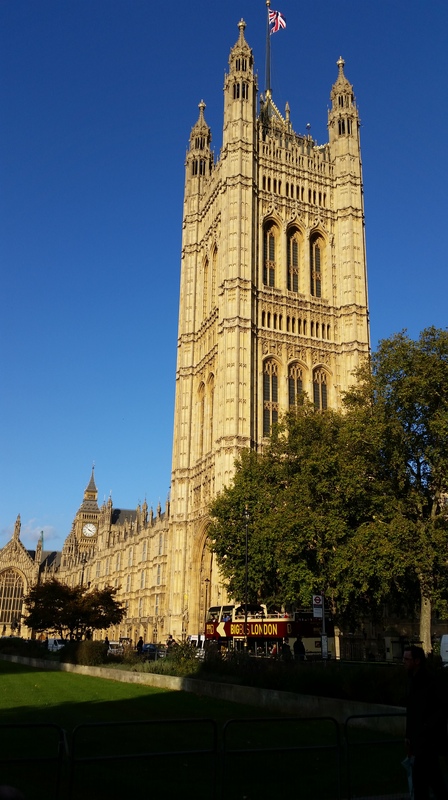 On Tuesday I was lucky enough to have the opportunity of visiting the Parliamentary Archives. 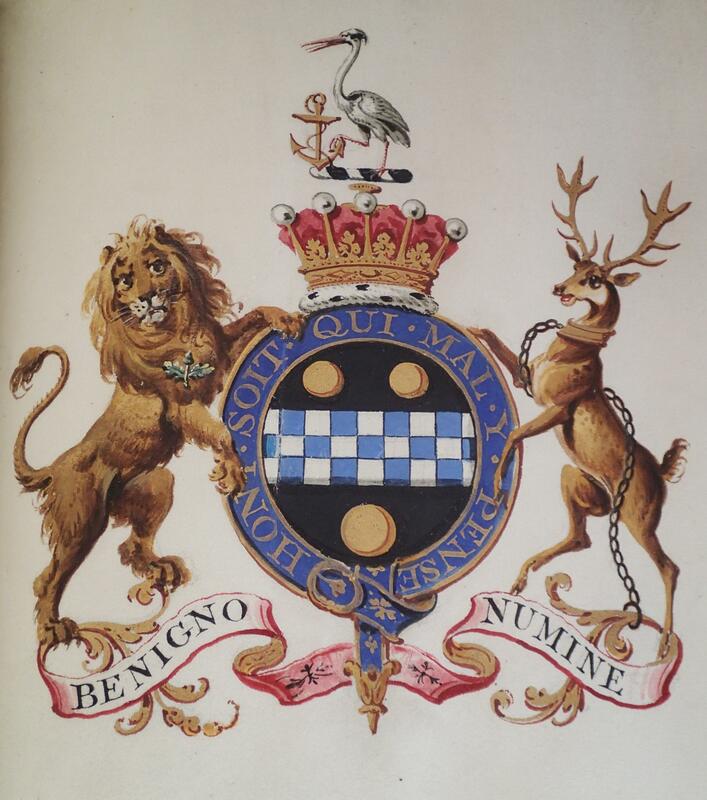 My research purpose was to check out the Proxy Books covering the House of Lords career of the 2nd Earl of Chatham (1778 – 1835), but since I was on the spot I decided to order up Chatham’s official House of Lords Pedigree as well. The practice of delivering Pedigrees when a new peer took his seat in Parliament dates back to a House Standing Order of 11 May 1767, designed to put an end to succession disputes and confusion over descent. The practice of record-keeping by the Office of Heralds had lapsed over the centuries, and the importance of tracing accurate lineage was increased by the fact the House of Lords was both a political and a legal institution. The Standing Order required “that Garter King of Arms do officially attend this House upon the day and at the time of the first admission of every Peer, whether by creation or descent, and that he do then and there deliver in at the table a Pedigree of the Family of such Peer, fairly described on vellum”, covering the peer’s parents, siblings, spouses, children, and so on, “according to seniority, down to the day on which such Pedigree shall be so delivered in”. 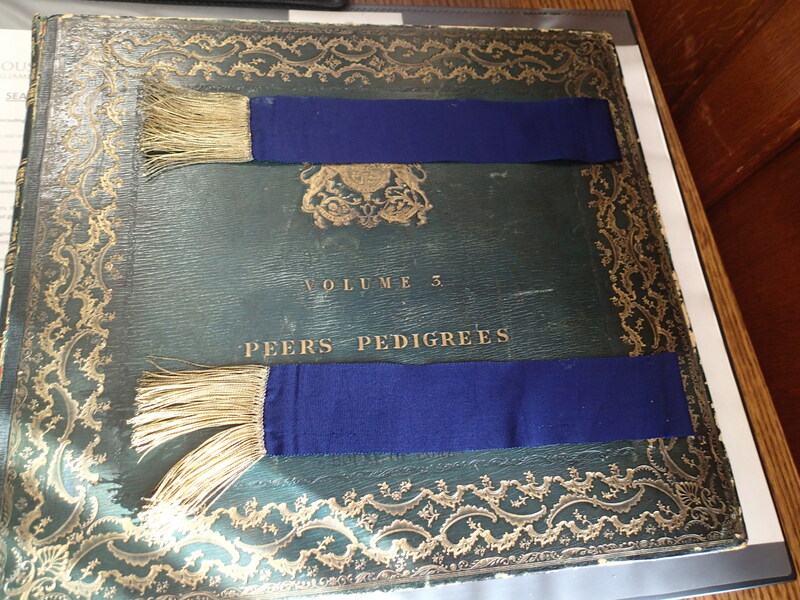 Each peer was permitted to prove his Pedigree before the Committee of Privileges, and a copy of the Pedigree would be kept with the Records of the House of Lords and the Office of Arms. I was hoping to settle a point that has been bothering me for a long time. A few days ago I blogged for Chatham’s birthday, and explained my reasons for believing him to have been be born on 10 October 1756. His father wrote several letters on that date announcing his birth, and when he was baptised on 7 November, the 10th October was recorded as his date of birth. However, his family celebrated his 17th birthday on 9 October 1773, and nearly everyone since has followed that lead. I therefore hoped that seeing the Pedigree might help settle the issue, and I was not disappointed. 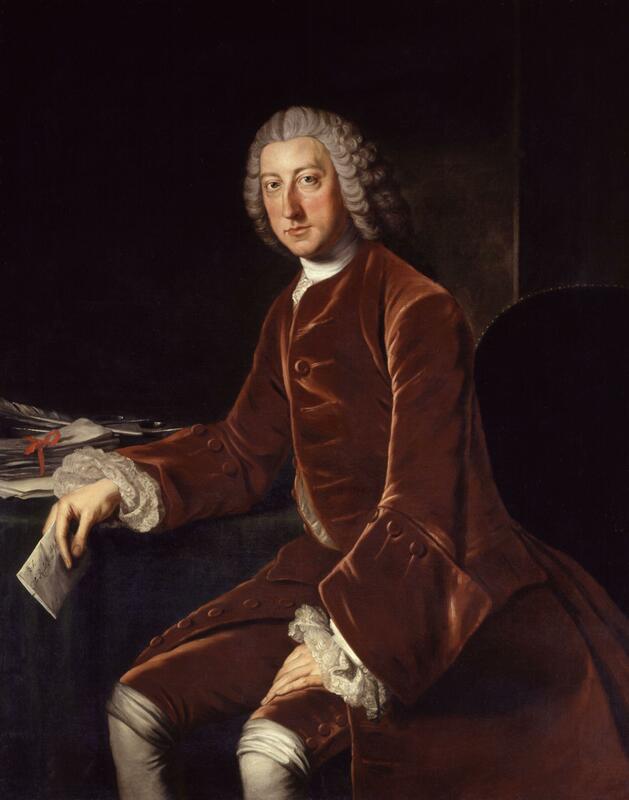 It seems Chatham’s registered date of birth is incorrect: the date of birth he provided the House of Lords, and declared “to be true to the best of my knowledge Information and Belief, upon my Honor” was — 9 October 1756. This, to me, seems to be a clear-cut case. It does not matter if Chatham was actually born on the 9th, or 10th, October, or bang on midnight (which is the most likely explanation of what happened): he believed his birthday to fall on 9 October, and that’s good enough for me. If that was all, this post would be much shorter than it is. But I was so utterly breathtaken by the sheer beauty of the thing laid before me on the desk that I felt moved to purchase a photograph licence, and then to request permission to reproduce the images on this blog (graciously granted). The Pedigree, on fine vellum as required by the 1767 Standing Order, was bound in tooled leather with fifty others spanning the period 1784-91. I am not kidding when I tell you it took both my strength and that of one of the archivists to wrestle it out of the box and onto the table. And truly, these photographs do not do it justice. The whole thing — every one of the fifty-one pedigrees in the box — was painted and written by hand. (They cost £20 to draw up, not an inconsiderable sum.) There was shiny gold leaf. There was calligraphy. There was — beauty. There is no other word for it. Here is Chatham’s crest, complete with Garter. The photograph does not really show the gold leaf on the Earl’s coronet and Garter, which frankly elevated this from “gorgeous” to “stunning”, in my opinion. The other Pedigrees in the book were equally beautiful, but as this was the one I wanted to see, I spent a good long while examining it and just drinking it in. I do not think I have been so entranced by a historical document for a long time. Beautiful — just beautiful. I’m so glad I’m able to share it. 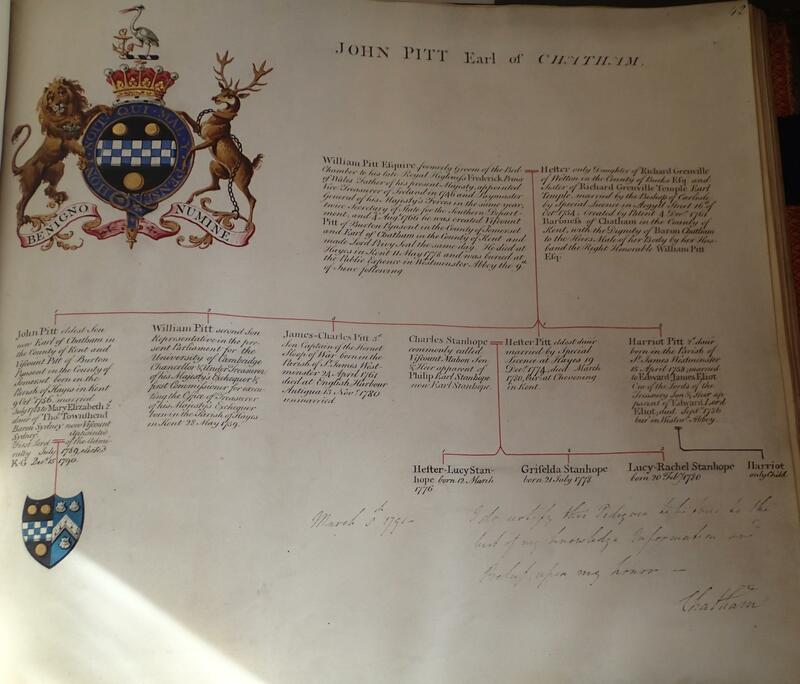 The Earl of Chatham’s Pedigree (endorsed 11 May 1791) is in the Parliamentary Archives, HL/PO/JO/22/1/3 f 42. All photographs used here were taken by me and reproduced with kind permission of the Parliamentary Archives. One thing’s for sure about the Pitts: they liked a drink or six. It started with Pitt the Elder, and got worse with the next generation. The Younger Pitt was famous for knocking back several bottles a day (although said bottles were, obviously, smaller then than they are now… still). The 2nd Earl of Chatham’s drinking habits are less obvious, but there were telling habits of his being, to use an appropriately nautical expression, “three sheets to the wind” during office hours while First Lord of the Admiralty. While Governor of Gibraltar he was famous for his hospitality, and it seems he acquired a taste for Spanish wines while there. (It seems appropriate that one of Gibaltar’s biggest modern wine distributors trades from offices in the “Chatham Counterguard”.) When Chatham died in September 1835, his executors brought in a high-society wine merchant, Charles Bertram, of 162 New Bond Street, to value the late Lord Chatham’s cellars in Charles Street. I should say right off that I am no wine expert myself. Far from it — I’m virtually teetotal and have been for fifteen years. However, just a glance at this list tells me two things: first, that Chatham had a lot of wine in his cellar for a nearly-eighty-year-old widower, and second, that he really, really, really did not care for French booze. I think it’s fair to say Chatham had a sweet tooth. 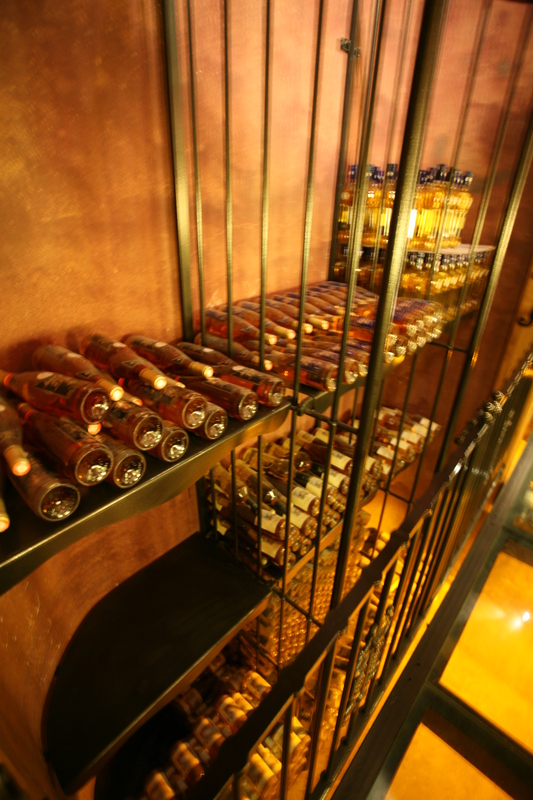 Most of the wine in his cellar seems to have been the variety served up as an aperitif or dessert wine. Sherry seems to account for the majority of it, in the largest quantities (sixteen dozen bottles, plus eight, of “Sherry Cadoza”, whatever that is — it seems to have something to do with the kind of cask, but I would be grateful if anyone could explain further). One variety in Chatham’s cellars, Haurie, had a sterling pedigree: the Haurie brand claimed to be the oldest exporters of sherry, having been founded during the War of the Spanish Succession. 19th century wine specialist Henry Vizetelly described Haurie sherry as a wine “over which Steele may have become more light-hearted, Swift more morose, Bolingbroke more eloquent, and Addison more didactic”. It probably already had a high reputation by the time Chatham acquired his eighteen bottles, but twenty years after his death Haurie sherry brought back four first-class medals from the Jerez Exhibition. Lord Powis: Lord Chatham, I’ve brought you a gift. Chatham: More Madeira. How kind. Powis: I know how much you like it. Chatham: Can’t you just bring me sherry next time? He also, however, seems to have been partial to Sercial, an “exceedingly rare” variety of Madeira described by Vizetelly as “somewhat spiritous” and known by Portuguese locals as “the dog strangler”. One source from the 1840s was, however, more appreciative: “This fabulous nectar, with its mellifluous flavour, has the pungent aroma of a posy of sweet-smelling flowers.” It seems this one is best left in the bottle for ten years or so. Possibly Chatham brought it back from Gibraltar with him, along with the three bottles of “Campanario” (another variety of Madeira from the west cliffs of the island near Funchal), although the age of the wines is not mentioned. One wine he definitely did bring back from Gibraltar was the “Paxarete”, or “Pajarete”, a variety of sherry made in the Jerez region of Spain. This would, in 1835, have been at least ten years old, and maybe Chatham was saving it for a special occasion. Paxarete, again, was exceedingly sweet, exceedingly strong, and exceedingly expensive, although one website described it as “considered more of a ladies’ drink” in early 19th century Britain. I suspect Chatham would have disagreed. So far Chatham’s cellars can be summarised as: sweet, and Spanish (or Portuguese). (The presence of “Malaga wine”, another super-sweet fortified Spanish wine, bears out this hypothesis.) There were some exceptions, however. Chatham had fifteen dozen pints of Constantia, a South African (!) wine from near Cape Town — unfortified, it seems, but renowned for its strength, and described by The Oxford Companion to Wine as “legendary”. (Napoleon, apparently, also drank it while imprisoned on St Helena.) And of course Chatham had a dozen or so bottles of Sancerre, a modest number of champagne bottles, and claret — surprisingly little of it, though, given his apparent love of it in the 1780s and 1790s. Only one vintage is dated, however: “Bertram’s claret”, specifically named as “1822”. (He had two dozen bottles of it.) I can’t, however, work out if this was a particularly good year for claret, or whether it was the only wine Chatham had purchased directly from Charles Bertram, who compiled the inventory and may just have recognised his own bottles. Apart from wine, Chatham had a few bottles of liqueur: “Noyau”, a crème liqueur made from apricot (or peach) kernels (hence its name). Chatham had both varieties in his cellar: the clear (“blanc”, or white) and the “pink”. One magazine from the 1830s described it as “the queen of liqueurs”, although it vastly preferred the white to the pink — which was in any case coloured, generally with cochineal. Chatham apparently agreed, as he had nearly twice as much white Noyau as he did pink. Apparently Noyeau tastes similar to amaretto, although I have had neither so cannot comment. It is also, apparently, dangerous to drink elderly Noyeau, as apricot kernels degrade into cyanide. I’m fairly sure Chatham died from natural causes, but now I’m wondering. Apart from “Cadoza sherry”, the only other item in Chatham’s cellars I have not been able to identify is the mysterious “Pardarolli”. Possibly it was another liqueur, but I cannot be certain. I would be grateful to anyone who is able to inform me what it is. 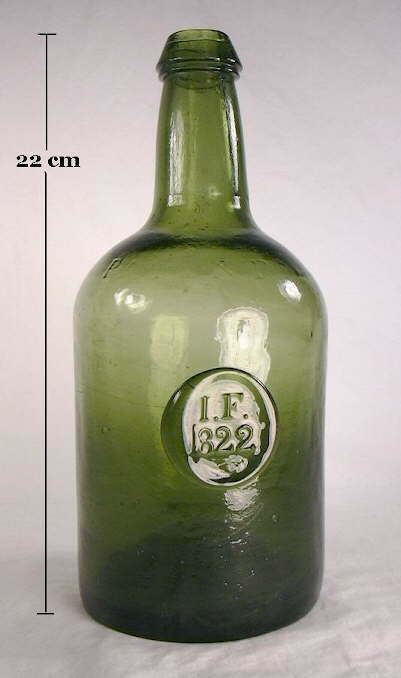 Bertram estimated the total value of all the bottles in Chatham’s cellars at £559.19.0, which is a sizeable sum, particularly as Chatham’s house itself only brought his executors £3000 (once the mortgage had been cleared). His heirs clearly divided the cellars between them, but they did put a small portion of the wines up to auction at Christie’s on 16 May 1836. They fetched £155.4.10. Bertram’s handlist of Chatham’s cellars can be found at the National Archives, Chatham MSS PRO 30/8/370 f 78 (dated 1 October 1835). The Christie’s sales catalogue, giving the list of the bottles put to auction and the amounts they fetched, is at PRO 30/8/370 f 147. Information on Charles Bertram from Richard Ford Manuscripts. YES, 10 October. Yes. YES. No, it’s not a typo. Yes, I realise I am flying in the face of all other published sources, except Wikipedia (and there’s a good reason for that). Well, that’s clear, isn’t it? Pitt the Elder should have known the date of birth of his own son, no? 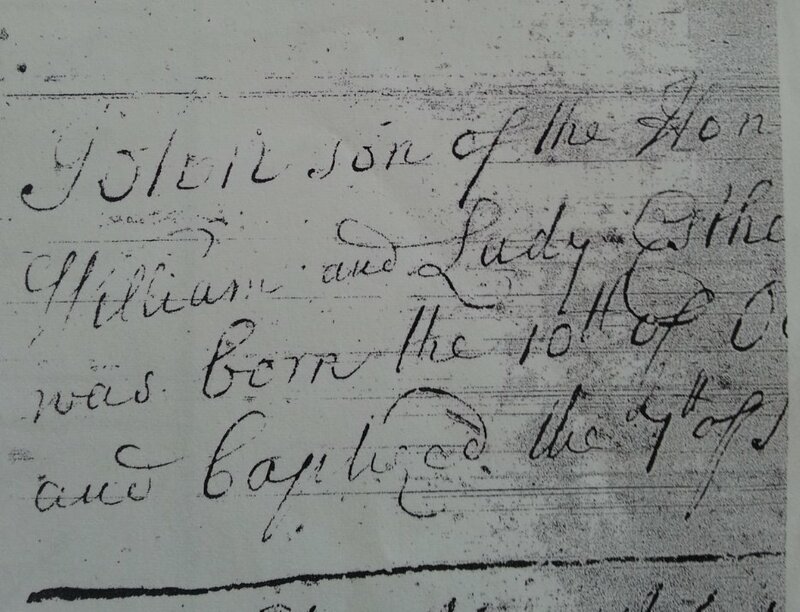 Not to mention the fact that Chatham’s baptismal record in the parish register, entered on 7 November 1756, notes his date of birth as 10 October. So what happened? Why the discrepancy? I suppose the most likely possibility is that everything went so quickly (and Chatham’s birth was, apparently, very quick) that nobody troubled to take accurate note of his time of birth. Maybe the clocks in the room were fast. Maybe the midwife (or man midwife, as Chatham was delivered by William Hunter) made a mistake. Clearly the family celebrated Chatham’s birthday on 9 October, although there could have been other reasons for this. In 1773, 10 October fell on a Sunday: possibly the family decided to celebrate a day early for that reason. I personally think this unlikely, however, as Pitt the Elder specifically says “THIS is the happy day that gave us your brother”. He could have misdated his letter, but this is unlikely, particularly as his son William replied a few days later making reference to “the rejoicings on the happy ninth of October”. It seems most likely, therefore, that the family for some reason changed their minds about Chatham’s birthday and started celebrating it on 9 October. But he would not be the only 18th century figure surrounded with such confusion — the Duke of Wellington’s precise birthdate, for example, is also disputed. This doesn’t make my task as biographer any easier, but I’ve plumped for 10 October rather than 9 October because Chatham’s baptismal record suggests that date. The entry was added on 7 November, nearly a full month after Chatham’s birth, so it seems most likely to me that any changes of mind occurred some time after his birth. I’ve therefore gone with the on-the-spot account, and shaved a day off the 2nd Lord Chatham’s age. You may disagree with me, but I’m sticking to my guns. Still in Gibraltar. 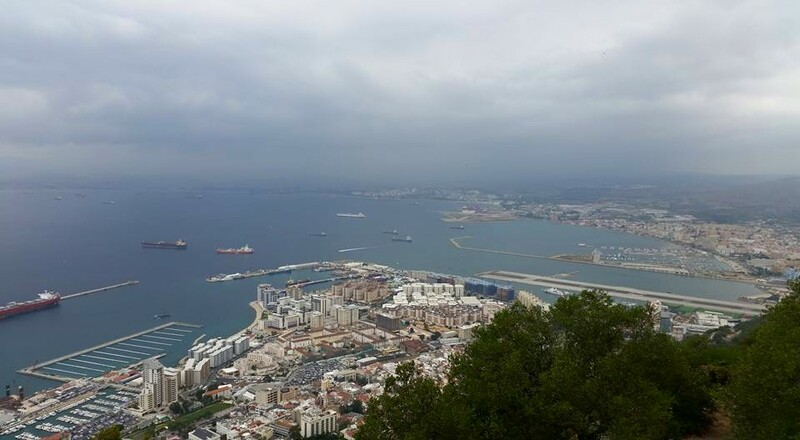 This morning I went up the Rock in a cable car (expensive but worth it) and sat on a bench overlooking the bay to write my chapter dealing with the 2nd Earl of Chatham’s active Governorship here, 1821-5. It was bliss, and I was completely untroubled by monkeys, lizards, seagulls, &c &c, which was a small mercy as I was surrounded by all the above. Nope, it was just me, my laptop, and John Chatham for three amazing hours. About half an hour after I took this shot, however, the path took me round private property (steep uphill climb across limestone shards? Why not!) and then back down again (steep downhill across limestone shards? Even better!). At this stage the path just came to a . Thankfully I could see the paved road about ten metres below me, but somehow I had to get down to it. So I climbed. Well, you know, I had no alternative (other than walking back the way I came for 45 minutes … er no, thank you, and yes, I still had my laptop with me). 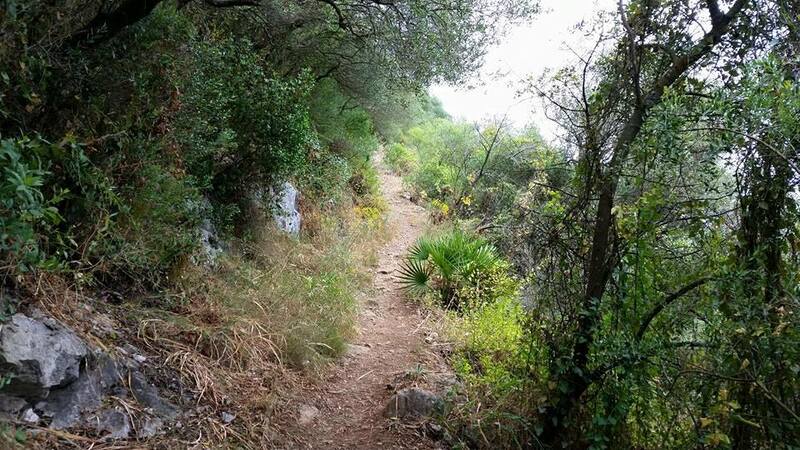 So there I was sliding down the side of the Rock, totally channelling my inner James Bond (well, I wasn’t sure whether or not I was trespassing on MoD property…) and it occurred to me to wonder whether the 2nd Earl of Chatham ever did anything like this while he was in Gibraltar. But no, of course not. He was in his late 60s. Which was the inconvenient moment at which it hit me. He was in Gibraltar in the 1770s too. As aide-de-camp to General Robert Boyd, Sir George Elliott’s Lieutenant Governor. How the heck could I have forgotten that?! And, while I was clinging to the side of the rockface by my fingernails (OK yes, that’s a slight exaggeration … but not much), I had a flashback of walking past a shelf at the Gibraltar National Archives on Tuesday full of volumes of official Diaries kept by the Governor’s secretary from the early 1770s to about 1810. I’d passed it by thinking “Ooh how nice, too early”, but … what if John was mentioned? I survived my descent, of course (I did say I exaggerated a bit) and, as it was only three o’clock, repaired as fast as I could to the Archives. I’m not 100% sure what they thought when I turned up all dusty, disshevelled and slightly sunburnt, but within a few minutes I had the 1778 and 1779 diaries open before me on the table. Within about ten minutes I startled everyone in the room with my cry of triumph. William Buckeridge, incidentally, was Boyd’s other ADC. I knew Chatham had arrived in Gibraltar early July 1778, but now I had a date — and also a ship, a departure point, and a journey length. 😀 But this is the mysterious bit. 23 days’ journey means the Romulus left Spithead on or about the 15 June 1778. So why did Chatham not attend his father’s funeral on the 8th? He must have had a cast-iron reason, otherwise people would have talked, but why not? I know the convoy was all embarked and ready to leave by mid-May: perhaps the ships were delayed by adverse winds? I find it hard to believe Chatham would have been refused permission to attend the funeral if it had been possible for him to go. And I find it even harder to believe he would not have wanted to go. Pageantry was John’s forté, and he did it very well. On the left: letters listed to Mrs Mary Pitt, Lady Mahon (Chatham’s eldest sister), Thomas Pitt, and the Countess of Chatham; on the right, letters to the Hon. 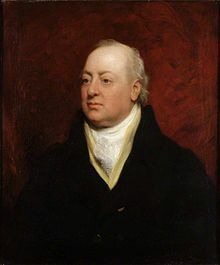 Mr Pitt, Pembroke Hall, the Marquis of Granby (later the 4th Duke of Rutland, Chatham’s best bud), and Lady Harriot Pitt, Chatham’s younger sister. Apologies for the quality of the above photo — the 1779 Diary is in pretty darn poor nick — but it reads “Leave of Absence for 6 months granted Earl of Chatham. Travelling Pass E. Chatham, Honble. Captain Conway and Lieutenant Colt to go to Madrid, 3 Months; also Permit for said Gentlemen to pass to Cadiz, to morrow, with 3 Servants and Baggage.” It was issued on 1 March 1779. I am so, so chuffed by this, you have no idea. It was totally worth nearly falling down the Rock for.